Living Wage IN a Livable Economy – Anticipate! Originally posted in November 2018 on the Edmonton CDC Blog. In Edmonton, approximately 140,000 workers are identified as low income earners (earning below $16.31 per hour), according to the Edmonton Social Planning Council (source, page 79). Four in five of these workers are over the age of 20 and 60% are women. The Canadian Payroll Association’s annual survey of Canadian workers identifies that in any given year 45% to 50% of workers across our nation are living pay check to pay check and would face significant hardships, including the loss of their residence, if they went without their pay check for one or two pay periods. These two sets of data are not indicative of an economy that is working for the majority of Canadians. While businesses may report continued increases in profits and gains for shareholders, this data questions those who laud our economy as strong, vibrant, and sustainable. For more than a decade, communities across Canada have been setting a “living wage” for their community and advocating for employers to adopt the “living wage” as the minimum hourly wage that they pay their employees. Key players in the development of the fledgling living wage movement have included the Canadian Centre for Policy Alternatives, Tamarack Institute’s Vibrant Communities Canada, Vibrant Communities Calgary, Vibrant Abbotsford, the Living Wage for Families Campaign, and Living Wage Hamilton. A “living wage” is different than the “minimum wage”. The minimum wage is legislated by governments, while a living wage is voluntary and based on what workers in a family must earn to pay for the “basic cost” of living in their community. 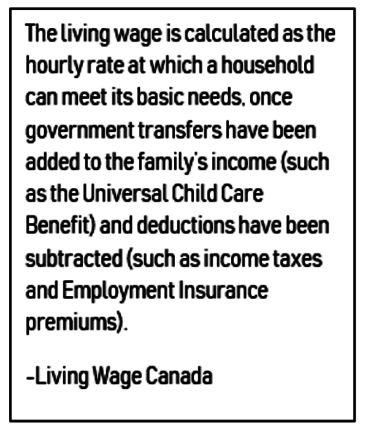 The primary focus has been on identifying a living wage for two parents (both working full-time) who have one child in full time day care and one child in before and after-school care. This means that the living wage is contextual to the cost of living in a specific community and to the configuration of a family. This results in varying living wages across Canada. In Edmonton, there are three living wage benchmarks (Source: Tracking the Trends 2018, Edmonton Social Planning Council). $16.31 per hour for each parent working full time in a two parent, two child family as described above. $17.59 per hour for a single person living on her/his own, working full-time. It is heartening to see communities collaborate on helping workers make a decent living. The uptake of a “living wage” so far has had some success. Most businesses that pay their employees a “living wage” are smaller businesses, but also include some funders, non-profits, and a few municipalities. So far, the biggest non-government employer to pay its employees a living wage or better is Van City, a credit union in British Columbia. The calculation of the living wage is based on family archetypes, which is understandable as a method, but it is also true that each family is different from the other. Archetypes are not reality. Employers do not hire employees or set wages based on family configuration. National employers typically do not have varying rates of pay based on geographic location of their employees. The “living wage” movement faces the major barrier of the private sector’s significant opposition to increases in the minimum wage. is a vehicle for promoting the benefits of social programs (e.g., child care). Full-time hours of employment between two parents (What constitutes full-time hours varies across Canada but is typically between 35-40 hours. I assume these exclusions are based on the principle of coming up with “a conservative, reasonable estimate” and perhaps engendering “significant and wide-ranging community support.” In doing so, however, the living wage inadvertently creates a “different” class of worker who should not expect to own a home, carry any debt, save or the future of their children’s education or for their own retirement. These exclusions are value-laden. I wonder if the focus on income programs like welfare rates, AISH pensions, minimum wage, and living wage (in its current form) naturally create and perpetuate a landscape that focuses on providing less to low income persons and those living in poverty than the mainstream would identify as the basic cost of living. In effect are identifying a living wage goal that has negative implications for the future of living wage earners. As mentioned above, the living wage benchmark is not going to result in employers paying varying rates based on family configuration. And perhaps the most significant problem of the living wage movement is that its existence leads people and organizations to conclude that the current approach to improving wages for workers is actually the model to emulate going forward. I wonder if a better way to look at wages is to explore what a “livable economy” looks like, which would be an economy that is profitable for the private sector, benefits the majority of workers and provides a standard of living that not only meets basic needs but also the needs workers have with respect to their future and the future of their children. Rather than focus on a living wage for workers, should we be exploring what a “Livable Economy” is or should be, a robust economy that includes profitable businesses and an equitable share of business prosperity by workers? Should a livable economy have principles that includes the ethics of business and work? What would be the major attributes, features, elements of a livable economy that differentiates it from the current economy? Should a livable economy work for the majority? And how would it address the needs of those who are unable to work full time, part time or at all? Could it be that current tools and measures used to assess poverty rates (e.g., Low Income Measure) present and perpetuate unintended barriers to identifying what a livable income could or should be for workers? Should there be an alternative to the current methodology in identifying a living wage across Canadian communities based on the principle of “equitable prosperity” and other principles that ensure that all workers cannot only have a decent economic life currently but also see the possibility of prosperity in their futures? To what extent do government subsidies promote or pose obstacles to the concept of a livable economy? For example, do benefits like the Child Tax Benefit unintentionally serve as rationale employers can use to keep wages low? The Edmonton CDC, in collaboration with others, hopes to undertake investigation to what wages should or could look like in a livable economy that works for the majority of Canadian families and individuals. I hope to report more on this work in the future. ‹ PreviousTHERE’S MORE TO DO TO IMPROVE AISH, ISN’T THERE?